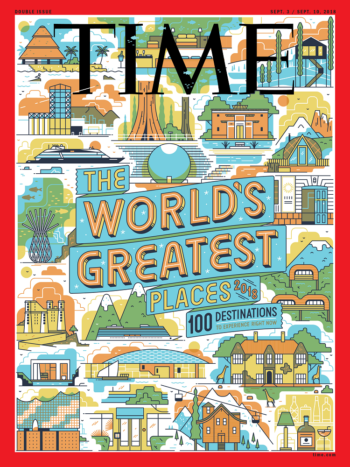 The latest issue of Time magazine introduces its inaugural annual World’s Greatest Places, with a list as diverse as the planet it reflects. Meant to be an insider guide aimed at spotlighting ‘new’ and contemporary global attractions and destinations, as opposed to the usual suspects, this list comprises eccentric selections within a variety of categories, including places to visit, stay, eat and drink. 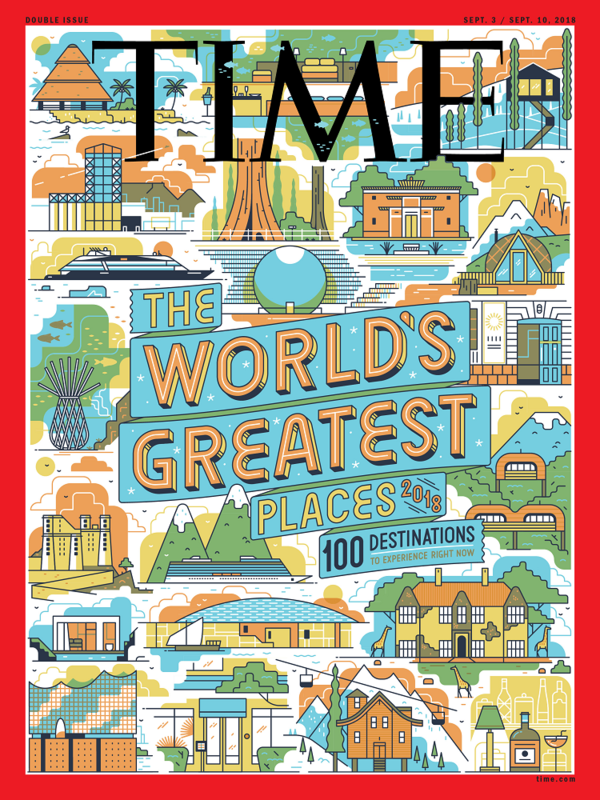 Showcasing anything from museums to hotels, TIME’s list is a collection of suggestions from the magazine’s impressive global network of correspondents, evaluated and selected based on quality, originality, innovation, sustainability and influence. All in all, there are 100 entries covering six continents and 48 countries. The only South African listing is Zeitz MOCAA in Cape Town, a point thankfully balanced by the cover for this issue, which is illustrated by Cape Town’s very own Studio Muti. This prolific studio never seems to fail, consistently delivering world-class illustration. Last featured in this column in June of this year detailing work done for London’s TimeOut magazine, Muti’s work for this TIME cover — with its monoline illustration, animated typography, bold colour relations, dynamic grid usage, textured space, and stylised geometric visual language — is one style that the studio has become known for and has refined to perfection. 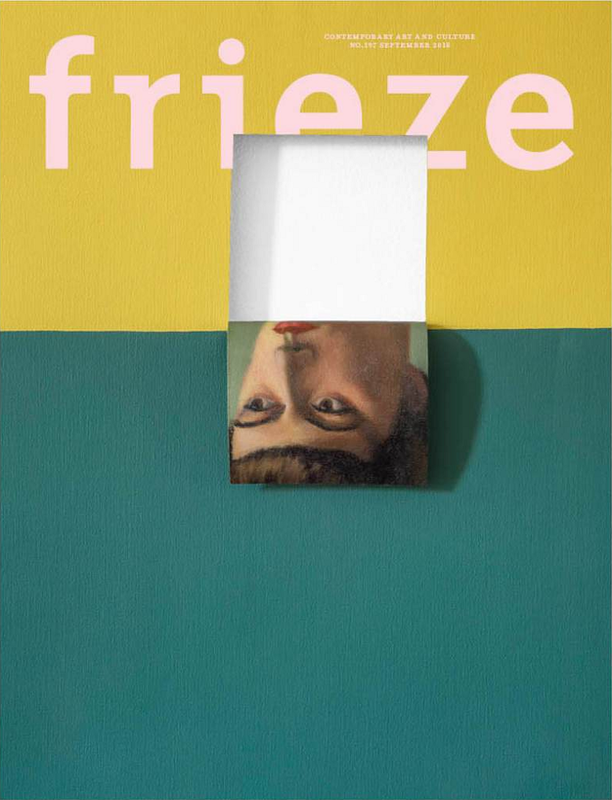 The cover for contemporary art and culture magazine, frieze, features an oil painting by Brazilian artist, Valeska Soares, titled “Nickel Titanium Yellow/Permanent Green”, taken from her Doubleface series. Soares has drifted away from her early studies in modernist architecture, currently producing art that investigates phenomenology alongside notions of desire and opposition, to name a few. Known for her sculptures and installations which are somewhat informed by her architectural background, in the Doubleface series, she ventures into a poignant yet formal painterly style informed by the seemingly opposing tradition of portraiture and the history of abstraction. She does so by appropriating, restoring, and altering old portraits of anonymous women who have alluring qualities. By restretching the old canvas and painting on the back of the original work with flat, subdued tones, and physically cutting into the material, folding it to expose selected evocative feminine features, Soares formally disrupts the surface, exploring the tension that is created by the opposing substrates. And, so, she subverts orthodoxies within modernist painting, effectively merging abstract painting with representational painting and simultaneously rescuing her found paintings of anonymous women from oblivion. These paintings are exhibited alongside her rugs, which form part of Soares’ “Ground” series. The rugs are cut, folded, and painted in the same manner as her paintings, pieced together as collages and dissecting political and social issues connected to borders. 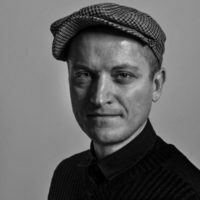 Based in London and Barcelona, In Shades is a monthly online magazine that delivers off-beat combinations of short fiction and illustration, analogous to other print publications mentioned at some stage in this column, such as Jungle Jim, A Profound Waste of Time, and Counterpoint. Delving into unknown terrain online, the magazine works with a global network of contributors, accompanied by selected submissions, in order to effectively combine short fiction with illustration. Founded by illustrator/art director, Marina Esmeraldo, and writer/editor, James Vincent, this husband-and-wife duo has pieced together a site that is filled with an assortment of writing and illustration styles. With a new short story published weekly alongside bespoke visuals, this formula performs well to construct a neatly designed site. There’s also a side project called Six Words, where ‘micro stories’ using only six words are interpreted in various ways using mostly typography. 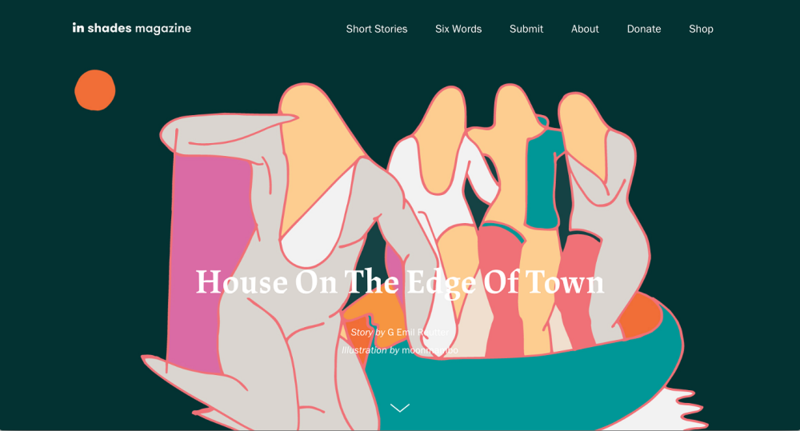 The latest short story, titled “House on the Edge of Town” is written by G Emil Reutter and illustrated by moonmambo. The most-recent Six Words, titled “We exchanged Christmas presents in Departures”, is a collaboration by Esmeraldo and Vincent themselves. 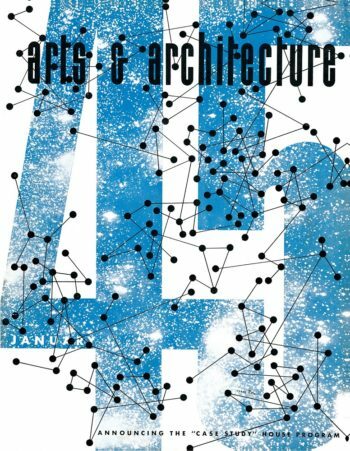 First published in 1929 as California Arts & Architecture magazine, by 1945 its name had evolved into Arts & Architecture magazine (A&A). Starting in the ’20s as a fairly conservative architecture publication, post-World War II the magazine had developed into an avant-garde design, architecture, and art magazine with greater experimental and social tendencies. The cultural history of Los Angeles, and the brand of modernism that had developed on the west coast (of northern America) at the time was of special interest for the magazine’s editors, particularly John Entenza, who was at the helm of the publication from 1938 until 1962. With this foundation, A&A helped to establish LA as a cultural hub, performing an important role in the cultural history of the city, and modernism in general within the US. Under Entenza’s editorship, A&A moved away from cultural historicism and architectural nostalgia that had placed emphasis on the decadent houses of the wealthy, opting rather for low-cost housing, experimental projects, and more socially aware architectural endeavours. Typical of most avant-garde publications, A&A existed on a meagre budget. Taste was a relative topic, open to critique and, if any content came from abroad, the magazine preferred influences from often-overlooked or -ignored sources, such as Mexico, as opposed to the obvious influences from Europe. A&A’s purpose was to expose the magazine’s mostly untrained readership to ‘good’ design and, at the same time, steer its professional readers towards the greater modernist worldview. 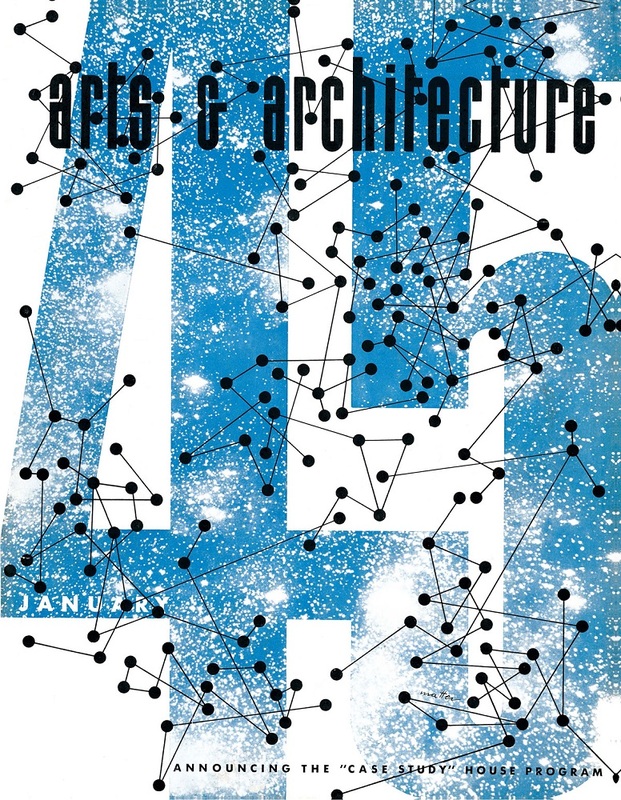 The post-World War II era was an energetic period for A&A, and its eclectic blend of culture and politics made the magazine a forerunner for design, architecture, and the arts, introducing the world to the work of Richard Neutra, Charles Eames, Frank Lloyd Wright, and Frank Gehry, to name a few. A&A’s covers had an element of dada, recalling the work of Kurt Schwitters, thanks in part to the magazine’s graphic designer, Swiss-born Herbert Matter, who would himself go on to influence modernist design, specifically with his use of photomontage in the commercial arts. A&A was not averse to offending advertisers or architects, but it did often present projects free from scrutiny, allowing structures to speak for themselves. If text was included, it was mostly limited to a short statement, normally the architect’s description of the project and the building. By 1962, with a paid circulation 8 500, Entenza decided to relinquish his editorial reign at the magazine. David Travers, author of a recent book detailing the magazine’s history, titled “Arts & Architecture 1945–49”, succeeded Entenza and remained the magazine’s editor until its closure in 1967.